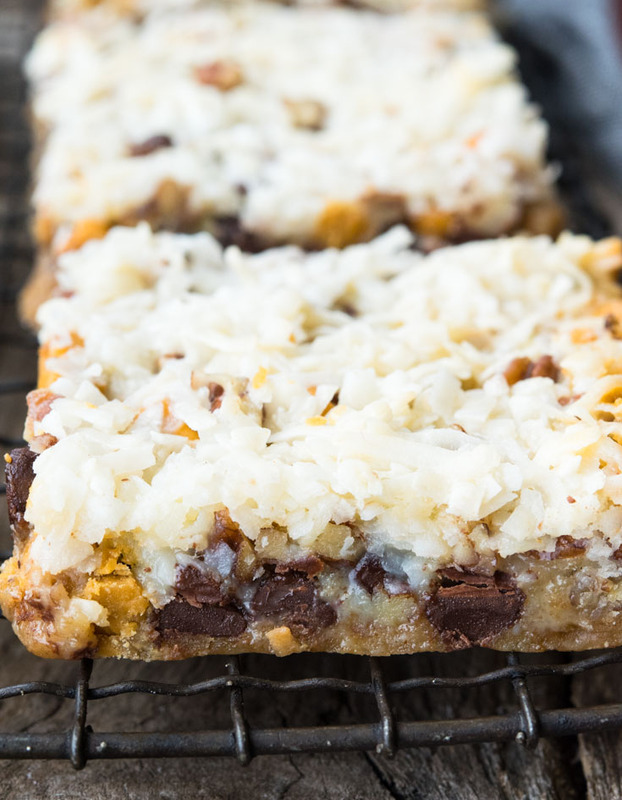 These one pan 7 Layer Bars are crunchy and gooey…just what you need to satisfy that sweet tooth. Whip them up for your next get together! One pan. I love to cook, but I love the minimal clean up even more! They’re a triple threat! Crunchy, buttery and sweet…yes, please. They remind me of the holiday season, so every time I make them I feel just a bit of that indescribable, warm holiday cheer. They are the perfect party cookie because you can make them quickly, double them easily and serve them on the smaller side!!! What are 7 Layer Bars? My 7 layer cookie bars recipe is traditional and totally delicious. The layers aren’t solid layers like a cake but are piled on top of one another, they melt and combine in the oven creating one ooey gooey cookie bar. 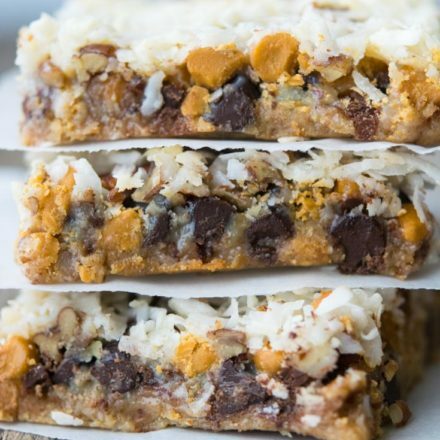 Also referred to as 7 layer magic cookie bars, the ingredients used in 7 layer bars come together to create a combination of sweet, buttery and salty. In the same fashion as my Yugoslavian Christmas Cookies (a beautiful blend of lemon, blackberry, walnuts, and meringue) the flavors just naturally flow together as if they were meant to be. 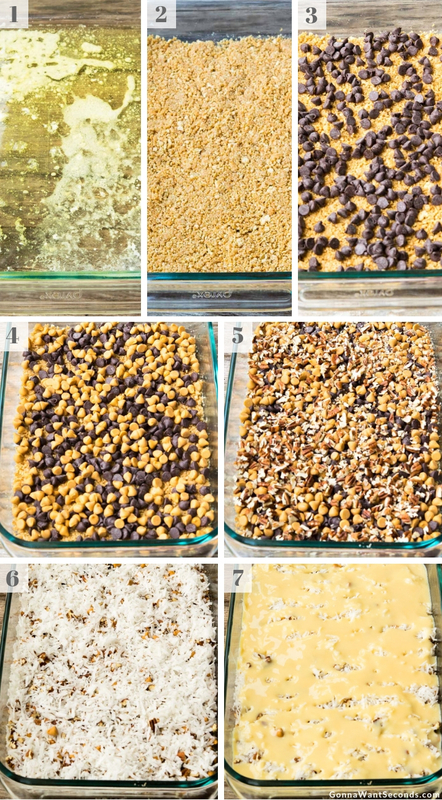 What Ingredients Do You Need To Make 7 Layer Bars? For my 7 layer bars, you’ll start with butter and follow with graham crackers. Chocolate and butterscotch chips come next. 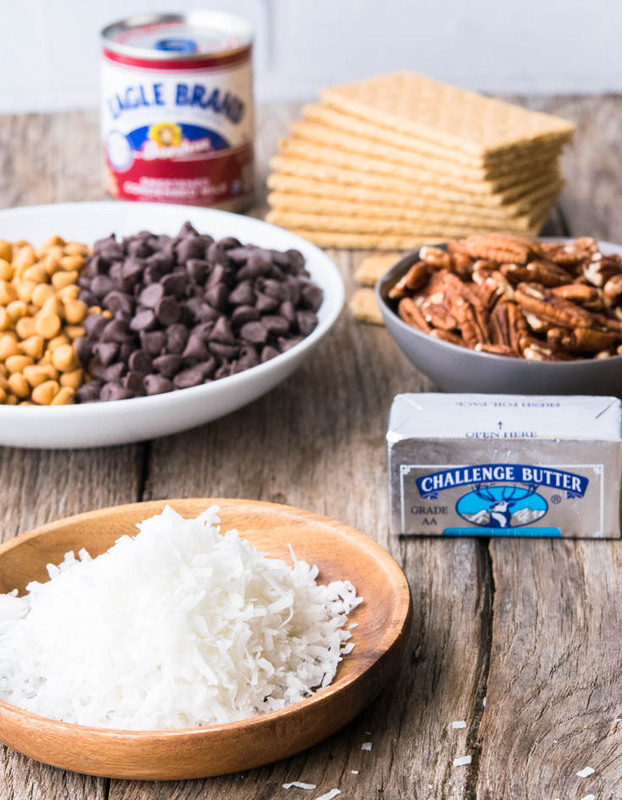 Bring on the salty sweetness with chopped pecans and sweetened condensed milk. Shredded coconut provides a slight chewiness and a ton of flavor. 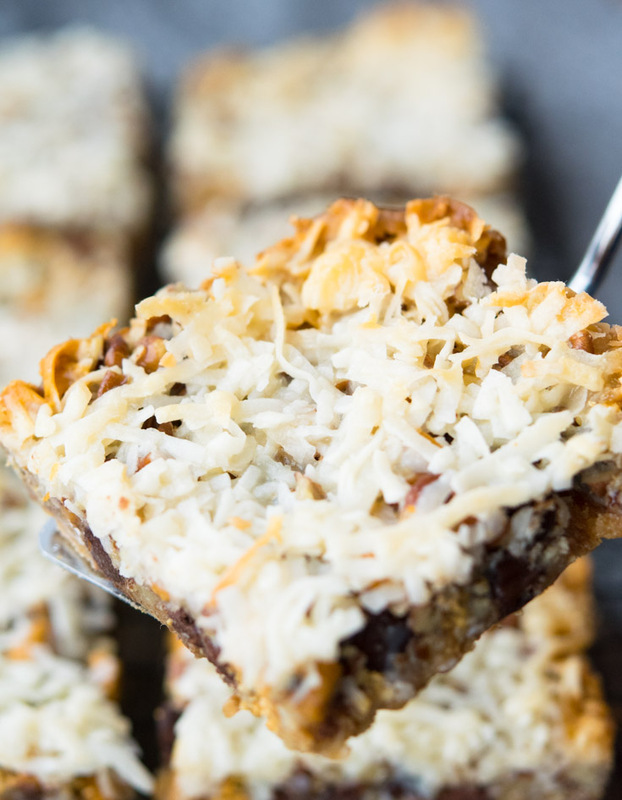 You can make 7 layer bars without coconut, but you risk losing a major taste component. How Do You Make 7 Layer Bars? 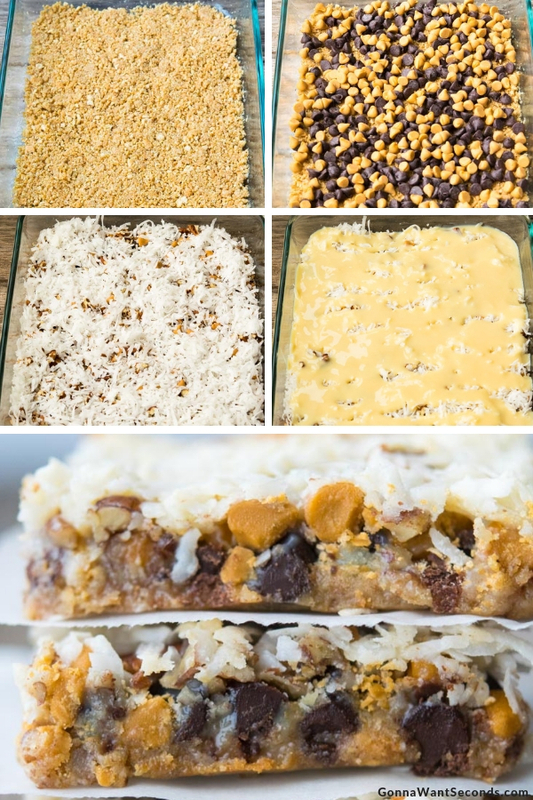 7 Layer Bars are so easy to make. I like to keep the ingredients on hand for a lazy Sunday or rainy afternoon, just to whip up. Preheat your oven, and toss the butter into a 9×13 baking dish. Place it in the oven until melted completely. Give it a swirl and add your crushed Grahams. This is where you’ll create the crust. The crust is delicious and important. Please do not make 7 layer bars without graham crackers unless you absolutely have to. If you’re looking to make your 7 layer bars gluten free, you can find gluten free graham crackers at most supermarkets. Moving right along. Once you’ve got your crust, sprinkle with chocolate chips and follow up with butterscotch chips. Eyeball it, and then maybe sprinkle just another handful or so of each. Yum. Add your chopped pecans and coconut, and then cover all that deliciousness in the mother of all dessert ingredients: sweetened condensed milk. My grandma always used to say that if a recipe has sweetened condensed milk, you know it’s gonna be good. She’s in good company since the 7 layer bars Food Network recipe uses it as well. Pop it in the oven until the top is golden brown (20-30 minutes) and cool completely. 1. Preheat oven. Add butter to a baking dish then place it in the preheated oven until completely melted. 2. Add graham cracker crumbs to melted butter and mix. Spread the crumb mixture evenly in the baking dish and press it firmly. 3. Sprinkle chocolate chips on top. 7. Pour the condensed milk evenly over the top of the layers. Bake for 30 minutes or until the top is golden brown. Cool completely. Serve. These one pan 7 Layer Bars are crunchy and gooey...just what you need to satisfy that sweet tooth. 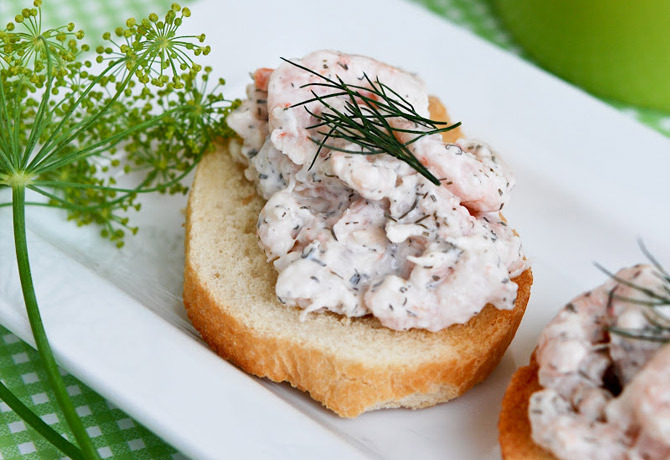 Whip them up for your next get together! Add butter to a 9X13 inch baking dish then place in the preheated oven until butter is completely melted. Sprinkle the graham cracker layer with the chocolate chips, then the butterscotch chips, then pecans, then the coconut. Pour the condensed milk evenly over the top of all the layers. Bake in preheated oven 25-30 minutes, until the top is nicely golden brown. Cool completely before cutting into serving pieces. White Chocolate Chips: Add them! They make a great play on flavor and a fun visual when the bars are sliced and served. Sprinkle them on when you add the chocolate and butterscotch chips. 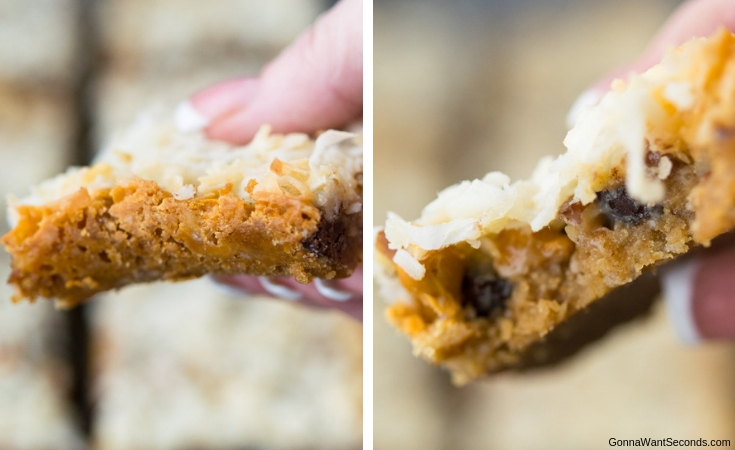 Sweetened Condensed Milk: While I tend to side with my grandma when it comes to her passion for this glorious ingredient, you can make 7 layer bars without condensed milk. If you’re feeling a little vegan, you can use a banana puree to sub for sweetened condensed milk. Crazy, I know! Puree three bananas in your blender, pour them over the crust but do so before you add your toppings. Bake and let chill overnight. If you’re not feeling so adventurous, the internet is full of homemade recipes for sweetened condensed milk. It can be made by combining milk, sugar and occasionally vanilla extract and simmering until combined and thick. However, it can be time-consuming for a dessert meant to be fast and easy. It’s your call, dear readers, but I’m still siding with Gram. Can You Make 7 Layer Bars Ahead Of Time? A wonderful feature of most bar desserts, including my Sugar Cookie Bars, is that you can make them ahead of time and bake when you’re ready. Assemble the bars a day or two before, cover tightly with plastic wrap and refrigerate. When you’re ready to rock, preheat the oven and in they go. Can You Freeze 7 Layer Bars? Yes, you can and they taste incredible cold. If, and that’s a real BIG if, you’ve got leftovers, portion them out into freezer safe bags or containers and place them flat in the freezer. Bring them to room temperature to thaw, or better yet eat them while they’re still a little chilly. You’ll thank me later. 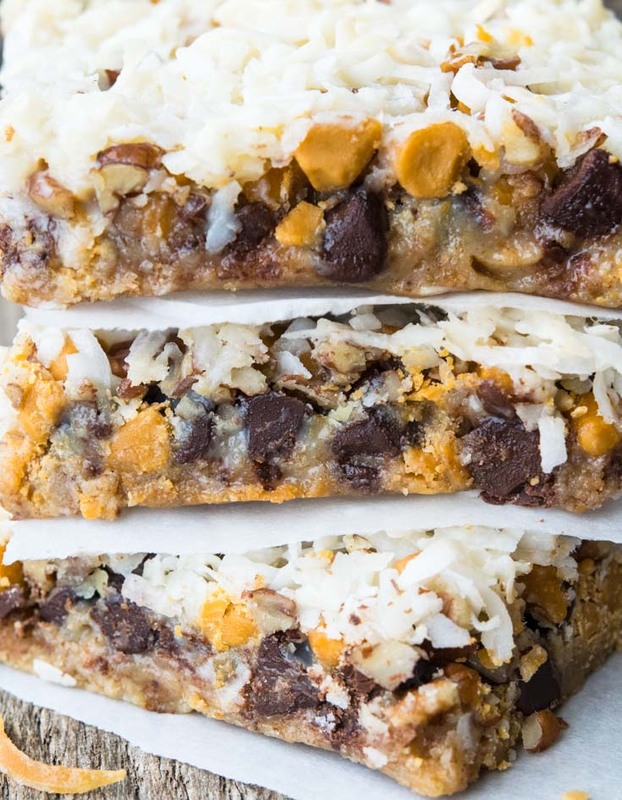 It is actually possible to make 7 layer bars healthy. Well……. a little healthier anyway. 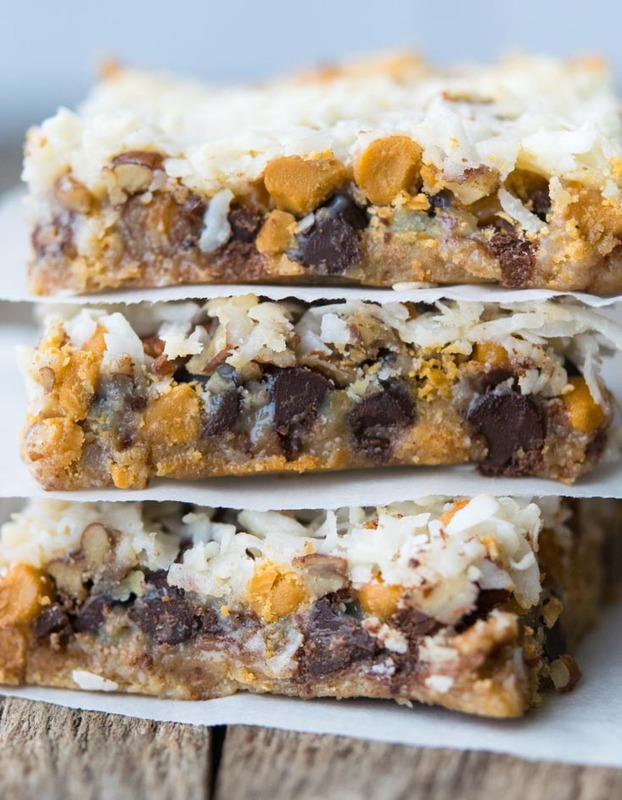 If you’re worried about 7 layer bars calories (which are listed below), you’ll find that this version won’t help you. 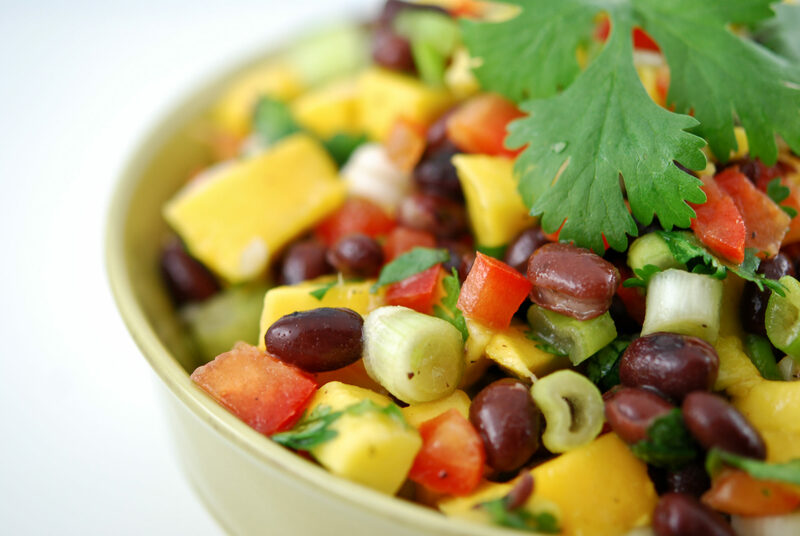 Though healthier, the light version is packed with healthy fats that come with a high calorie count. They are great for an 80/20 clean eating diet though, so give them a try and let us know what you think! Don’t get discouraged, calorie quality is important! For the crust: 1 ½ cups oven-toasted oats, 1 cup oven toasted walnuts, 1 cup of drained and rinsed chickpeas, ¼ cup ground flaxseed, 2 tablespoons melted butter, 2 tablespoons canola oil and a pinch of salt. Combine in food processor and press into pan. Is there a substitute for the coconut or can I just leave it out ?